If you’re a newcomer to FIFA Mobile, you may have already noticed one glaring flaw about your starter team: they’re slow! Not only do they take a while to run from point A to point B, but they’re also sloppy, and are prone to lose the ball easily when sprinting. This is normal in the beginning since your players are not trained at all and are at their absolute lowest level at this point. However, while you can definitely increase their attributes with timely training sessions, some players simply opt to replace them for much better base alternatives and then build them up via training. If you’re looking for the best players in the game, you need to focus on their Pace stat, which is a combination of both Sprint Speed and Acceleration. Players that excel in this attribute often control better on the field and can usually outrun the competition through sheer speed. Similarly, while overall defensive power is determined by other attributes, a defense with high Pace will have no troubles catching up to the opponent and exerting pressure on the ball. Memphis is a Dutch former Manchester United Player, who currently plays winger for the Olympique Lyonnais in Ligue 1. During his beginnings, he was regarded as one of the hottest rising talents in Europe due to his ability to dribble, cut inside, to play with the ball off the ground, and for his affinity for distance shooting, which made him a force to be reckoned with in the field. His professional career began in the 2014-15 season playing for PSV Eindhoven when he went on to become the Eredivisie’s top scorer, with a total of 22 goals in 30 matches under his belt. His exploits landed him a contract with Manchester United in 2015, where he struggled to keep up in the Premier League. Afterward, he signed with Lyonnais in January 2017 and has since picked up his game. 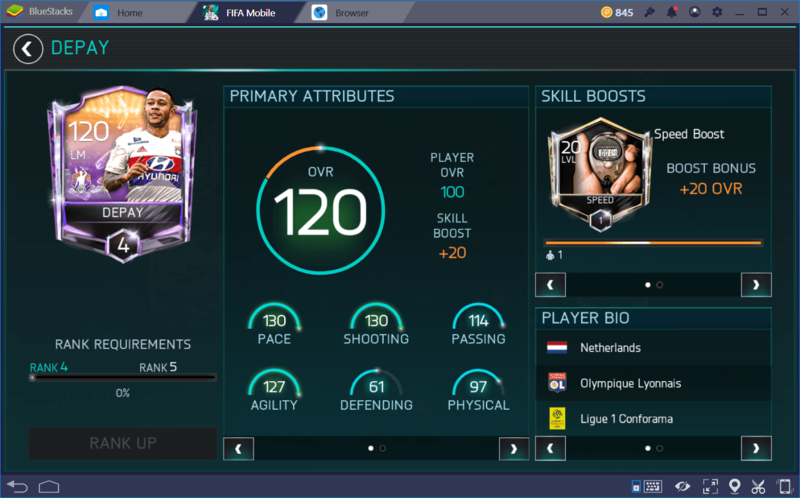 Due to his exploits, Depay was selected for Player of the Month (POTM) in FIFA Mobile in 2017. His POTM card has 103 Pace. This list wouldn’t be complete without a feature from the poster boy for FIFA Mobile. Cristiano Ronaldo was a former player for Manchester United, before going on to join the biggest club in Spain, Real Madrid FC, and winning essentially every prize that League football has to offer. Cristiano Ronaldo (or CR7, as he’s often referred to due to his number 7 jersey), is often considered among the best football talents the world has seen, alongside his eternal rival Lionel Messi. The football star has earned 5 Ballon d’Or awards, and is the first player in history to earn 4 European Golden Shoe awards. He has also won a prestigious number of awards in many categories, including league titles, and UEFA Champions League titles. He is currently the top scorer for both the Portugal National Selection, as well as in his current club, Real Madrid. 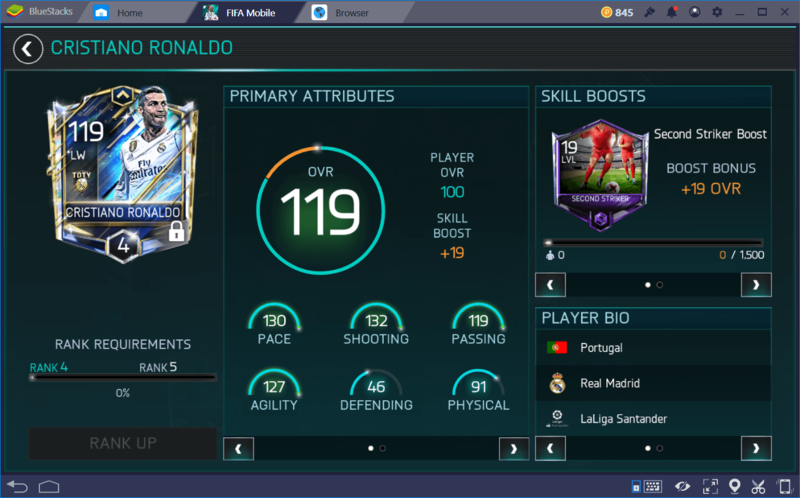 On FIFA Mobile, CR7 was selected as a Team of the Year Player, and his TOTY card has 103 Pace. Pulisic is an attacking midfielder or right winger currently playing for Dortmund. He is regarded by fans and prospectors alike as the top prospect from America. As such, he became the youngest player to ever represent the senior national team in a FIFA World cup qualifier. Furthermore, in 2016, he was the youngest foreigner to score a goal in the Bundesliga, as well as the youngest outsider to ever have played 50 league games. Also, he scored the 3000th goal in the Bundesliga for Borussia Dortmund. He was selected as a Record Breaker player in FIFA Mobile for his achievements in his young age. His RB card has 103 Pace. Bale is best known for his exceptional ability at precision kicking from a distance, as well as swerving free kicks, and his ability to penetrate the defense with unerring efficiency and grace. Due to his talents, he has received praise from fans and teammates alike, with positive comments regarding his speed, crossing ability, and control over his left foot. His prestigious career features stints with Southampton, Tottenham Hotspur and, most noticeably, Real Madrid, where he shifted his playstyle with a more aggressive approach. Throughout his professional life, he has received several commendations, including PFA Players’ Player of the Year Award, and the UEFA Team of the Year. In his time in Real Madrid, he helped the club win the 2013-14 Copa del Rey, as well as the UEFA Champions League, scoring in both finals. He was selected for the La Liga Rivalry in FIFA Mobile. His LLR card has 105 Pace. Originally from the Netherlands, Jeremain Lens currently plays for Beşiktaş. He is known for his versatility in the field, as well as for his endurance and speed, which make him a great winger or striker, as the situation demands. He began his professional career at AZ Alkmaar, while also helping NEC in their 2008-09 Eredivisie triumph after his loan. After his contract expired, he passed through several other football clubs, including PSV Eindhoven, Dynamo Kyiv and, most recently Sunderland. Lens was one of the starters in the Dutch squad that won third place in the 2014 World Cup in Brazil. 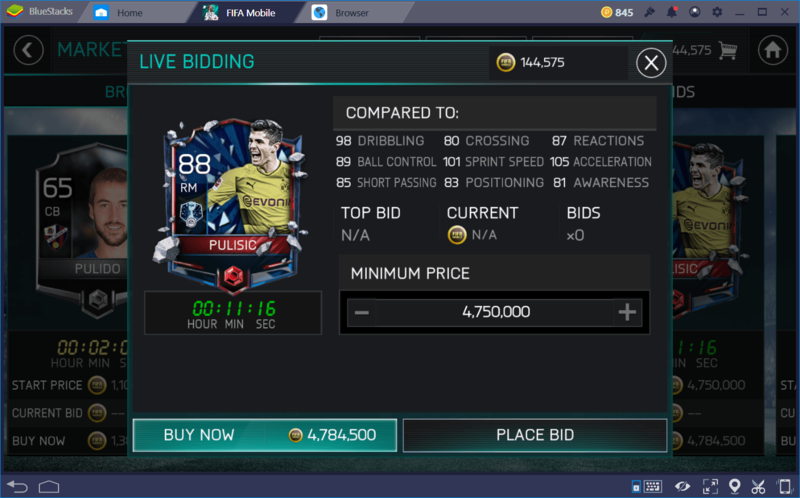 He was selected as a Campaign Masters Player in FIFA Mobile and can be obtained after beating Chapter V of the Eastern Europe Campaign. His card has 107 Pace. He is one of the biggest stars in the American football scene. Zardes has painstakingly built a reputation for himself on the field through sheer work and determination. He is an absolute beast when playing, considered extremely dangerous both with and without the ball. In the 2015 season, he scored 16 goals, alongside some assists. However, he suffered a serious injury that rendered him unable to play for some time. Nevertheless, he has made a full recovery and is scheduled to come back to the field this year as a starter for Columbus Crew SC. He was named a New Years Master in FIFA Mobile. His NY card has 107 Pace. Hailing from Argentina, Lautaro currently plays as a forward for Club Atlético Lanús, a dangerous one at that. He began his professional career in this very same club at the tender age of 18. He also spent some time in the La Liga club Sevilla in 2008. A few years later, Acosta returned to Argentina to represent Boca Juniors, as well as his former club, Lanús. In his career, he has helped to win six titles, including the 2016 national championship. On FIFA Mobile, he is part of the Campaign Masters Players and can be obtained by beating Chapter V of the South America campaign. His card has 108 Pace. For those who don’t know their football history, van Basten is a retired football vet who played as a forward for FC Ajax, and AC Milan, as well as a starter in the Netherlands national selection. Across his entire career, he scored more than 300 goals but was cut down in his prime at the age of 28 due to a serious injury that prompted an early retirement only two years later. Nevertheless, his exploits earned him a spot among the best players the world has ever seen, known for his close ball control, smart gameplay, and lightning-fast shooting prowess that left many a goalkeeper dumbfounded. 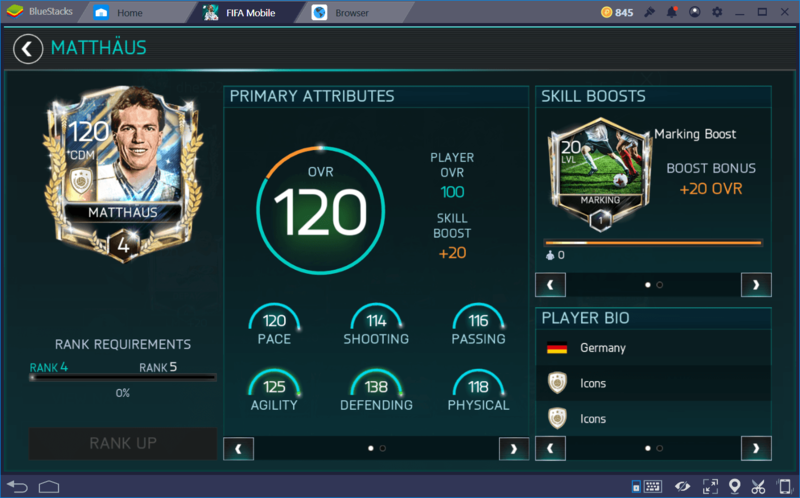 In FIFA Mobile, he is part of the Icons Players, and his Prime Icons card has a Pace of 114. During his active years, Lothar was an exceedingly-talented player, renowned for participating in 4 FIFA World Cups, which is more than any other player can say. He was the captain for the West Germany team that won the World Cup in 1990, and also became the leader of the Germany squad for the following iteration in 1994. During his long and prestigious career, Mattäus was known for his keen ability for passes and crosses, as well as for launching well-timed tackles that allowed him to singlehandedly stop many counterattacks before they even began. 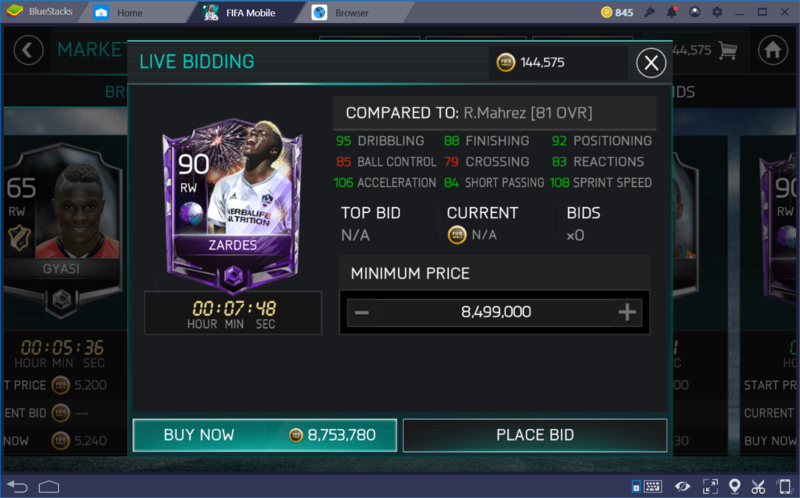 On FIFA Mobile, he is also one of the Icons. His Prime Icons card has 120 Pace. Like other players in the Prime Icons category, Ronaldinho is retired. He was a former starter on the Brazilian national team but spent most of his career making a name for himself in Europe. He was famous for his exploits playing for clubs like PSG, Barcelona, and AC Milan. He is considered as one of the best players of his generation, and possibly of all time. During his career, he scored two FIFA World Player of the Year awards, as well as a Ballon d’Or. Furthermore, he is one among the extremely talented group of 8 players who have won the FIFA World Cup, the UEFA Champions League and the Ballon d’Or, which makes him a world-class player. On FIFA Mobile, his Prime Icons card has 120 Pace. Now that you know all about the top 10 players on FIFA Soccer: FIFA World Cup the game, you’re all set to create an invincible team with your very pick of players. How does your list of Top 10 FIFA players in the real world compare to the list of top players in the game. Who are the Top players you would be rooting for this season? Do let us know in the comments section!